Steve Jobs, the iconic CEO of Apple has sadly passed away after recently announcing that he was stepping down from his role. During his time at the helm of Apple, he turned them into an incredibly successful brand with ubiquitous products like the iPod, iPhone, iPad and the range of Mac computers. 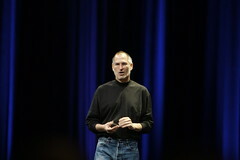 Apple is now synonymous with cool and this is largely due to Steve’s leadership and vision.